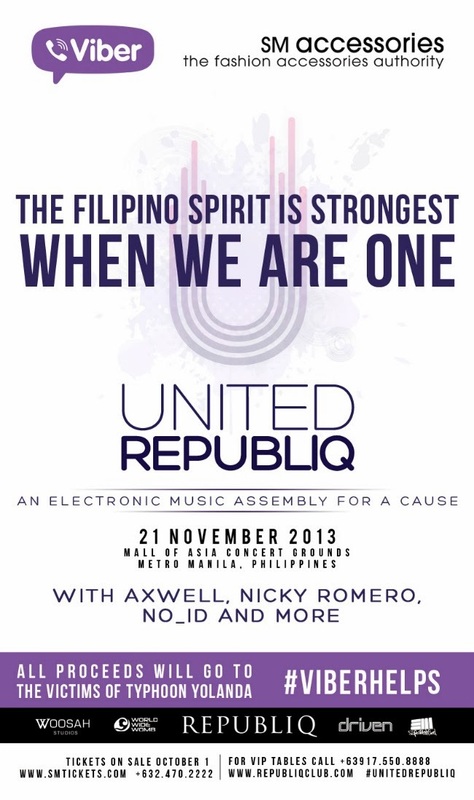 SM Accessories participates in the United Republiq Music Fest to bring you not jut the hottest EDM festival to hit Manila but to raise funds for Typhoon Yolanda/Haiyan victims as well. All international and local dj's participating in the event have agreed to pull together and contribute their talent fees pledging an estimated total of P7,000,000/00 to provide relief to those affected by the recent super typhoon. Among the dj's performing are Dj's Ace Ramos, Marc Naval, Martin Pulgar, and Mars Miranda to represent the Philippines while international dj;s include Nicky Romero who is known for collaborating with world renowned Dj's Tiesto, Avicii and David Guetta. Joining him is the Dutch duo Ralph Van Vugt and Devi van der Horst of NO_ID and finally, rounding up the list and headlining the event is none other than DJ Axwell of Swedish House Mafia fame!!!!! eeepppp!!!! I want to PAAAAARTTTYYYY for a Cause!!! I want to win this so baaaaad!!!! Omg huhuhu Lucky whoever wins!! Party for a cause 'yo!